“BuzzFeed helped me build a better product and not just sell my product," said Patti Ziegler, vice president of global marketing at Marysville, Ohio-based Scotts. 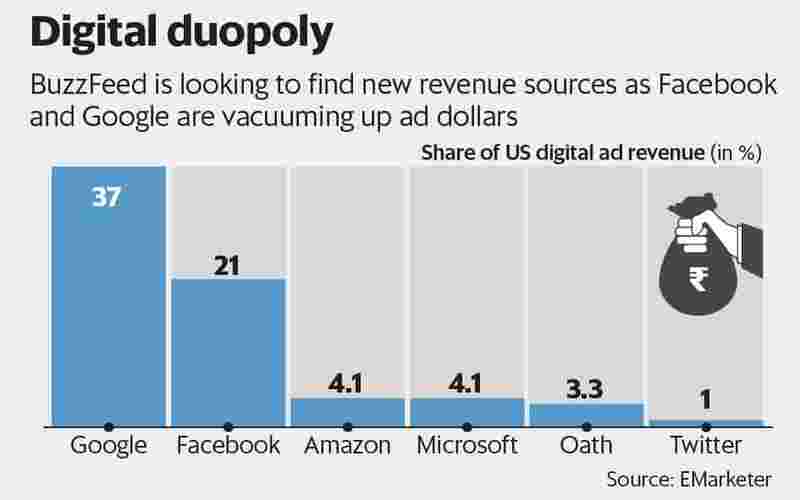 The case highlights BuzzFeed’s push to find new sources of revenue—an increasingly urgent mission as Facebook Inc. and Alphabet Inc.’s Google vacuum up ad dollars in the digital-media industry. BuzzFeed reportedly fell short of its $350 million revenue target last year. At the centre of the commerce effort is a BuzzFeed executive named Ben Kaufman, a 32-year-old serial entrepreneur with a reputation for creating youth-friendly products. For Scotts, Kaufman’s team assembled some 40 experts—including engineers, a horticulturist and a Brooklyn woman who lives with 700 houseplants—for a weeklong brainstorming session in December at BuzzFeed’s New York headquarters. The session was similar to Shark Tank, with a panel of experts narrowing down a list of product ideas each day, according to Ziegler. Kaufman’s 65-person team has generated about $50 million in sales this year from deals combining commerce and advertising, according to a person familiar with the matter. But it’s hard to tell how big such a labour-intensive process can ultimately become for BuzzFeed. Kaufman previously ran a start-up called Quirky that brought people’s invention ideas to market and cut deals with companies like General Electric Co., Mattel Inc. and Amazon.com Inc. But it ran out of venture capital funding and was forced to shut down. In an interview, chief executive Jonah Peretti declined to discuss his company’s revenue for 2018, but said it’s on pace to rise by a double-digit percentage. Commerce “is definitely a big part of our revenue growth," he said. BuzzFeed hopes that helping invent products can deepen ties with advertisers and capitalize on its audience data. The idea for Lunarly came after a BuzzFeed employee saw posts about mindfulness were popular on the website and a horticulturist noted that some plants only grow during certain times of year. The idea is to turn the usual advertiser relationship on its head, Kaufman said in an interview. “Firms make a thing, then tell media companies, ‘Please tell the world of this,"’ he said. “It should work in a more collaborative fashion. We should say, ‘Here’s what we think the world needs. Can you make this?’ And go back and forth." Typically, brands pay BuzzFeed to help develop a product and then agree to spend money advertising on its site. BuzzFeed may also take a cut. For Maybelline, BuzzFeed came up with the “Fundle", or a bundle of items for the beach, including a towel, lip balm and mascara. For Taste Beauty, BuzzFeed created “Glamspin", which serves as both lip gloss and a fidget-spinner toy.